Please scroll down for a map of France, showing how to reach the holiday gite if you're driving from the United Kingdom. Couiza is easy to reach by train, bus or car and there is ample well-lit, free public parking just over the bridge from the holiday gite, as shown on this map of Couiza. Route planners and detailed maps of towns in the Languedoc. Car Hire from Auto Europe - an English speaking firm who don't charge for last minute changes to dates, or even last minute cancellations. Flights to Carcassonne, Perpignan, Toulouse, Montpellier and Barcelona. The Aerobus service straight from Carcassonne airport to Couiza, which stops one minute from the spacious holiday lets. Train timetable. If travelling by train, we recommend the night train which is direct from Paris Austerlitz to Carcassonne. There is also a train service from Carcassonne to Couiza and a bus service from either Perpignan or Carcassonne to Couiza. Taxis - We recommend Sylvie, who is based in Couiza and can be reached on 0468 74 25 36. Bike hire in Couiza, Rennes-les-Bains and Limoux. The map on the left shows possible routes to take if you're driving from the United Kingdom, rather than using a hire car or taking public transport. You can see an actual route planner with detailed directions on www.maporama.fr, simply enter your starting destination in the iteneraries section and Couiza under 'City' in the 'To' section. Obviously, Couiza isn't a city, however this is how the website works. 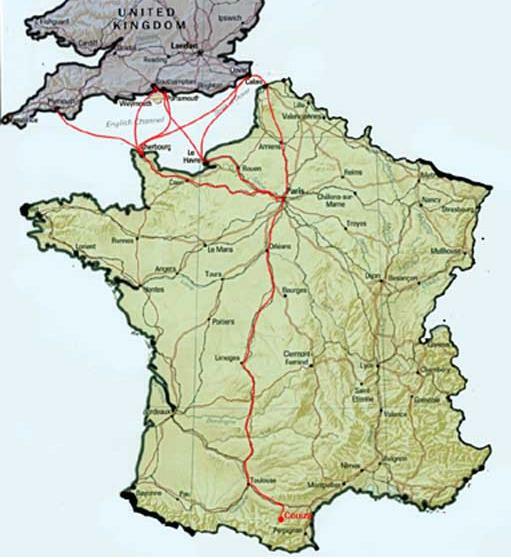 As you will see from the map, all routes go through Paris, then take the motorway South past Orleans, Limoges and Toulouse. Maporama also has quick links to real-time traffic info, which is useful whether you're driving all the way or catching a flight to an airport and hiring a car.